June 27, 1977 The 187 ton 100 foot steel oil screw tug/barge Ahaliq foundered in rough seas June 29, 1977 in Bristol Bay, 118 miles southwest of Dillingham. She was carrying materials and equipment to build a sewage treatment plant for the village of Kwigillingok when she began taking on water. Because of low freeboard, some of her deck cargo became buoyant in heavy weather and caused damage to the deck allowing water to flood her tanks. The vessel’s captain, David Summerfield Moon (43) of Seattle, was lost with the ship. 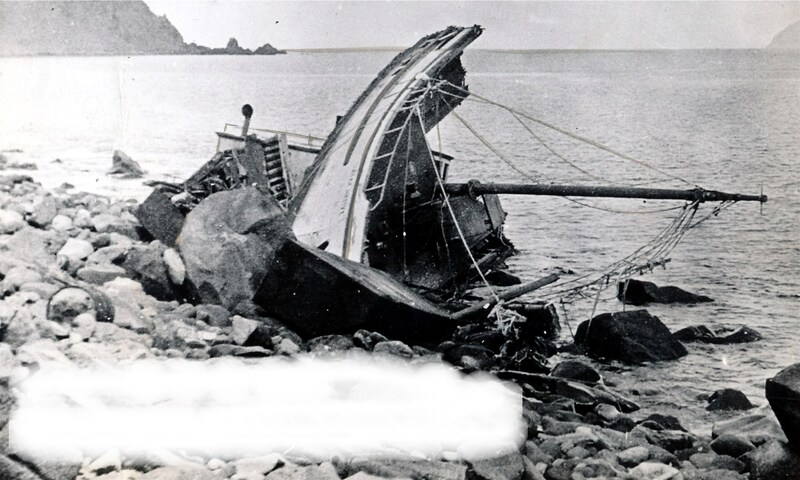 Four other crewmen boarded a lifeboat and were rescued four days later. Their raft was spotted by a U S Coast Guard C-130 and crewmembers Daniel Adams, Tim Jenkins, Raymond Sharp and Gary Sherman were picked up by the Coast Guard cutter Boutwell. July 10, 1977 One crewmember was lost and four were rescued from a life raft when the 134 ton steel fishing vessel Pacific Surf foundered 65 miles south of Cordova in the Gulf of Alaska. The vessel was on her maiden voyage to Alaska and was traveling between Ketchikan and Kodiak. After abandoning ship, Ole Hansen of Edmonds, Washington died of a heart attack in the life raft. The 894 foot supertanker Overseas Chicago took eight miles to stop when they spotted the four remaining members of the Pacific Surf. August 2, 1977 Three people were lost when an unnamed small boat went missing in Resurrection Bay. October 13, 1977 An unnamed small boat swamped in Big John Bay and two teenage boys were lost. October 22, 1977 Remains of the 34 foot fishing vessel UF 22 were found by the fishing vessel Columbia near the south end of Kodiak Island on Aiaktalik Beach March 2, 1978. No sign of the two persons aboard, last seen in October of 1977, was found. The UF22 was owned by brothers Charles and R L Taylor. October 26, 1977 The fishing vessel Eagle sank near Dundas Bay in Icy Strait with the loss of one of her two crewmembers. Rick Nelson of Petersburg, owner of the Eagle was missing and presumed drowned. Nancy Zaid floated in a survival suit for 8 to 10 hours and then wandered on the beach for 60 miles before she was rescued by a U S Coast Guard Helicopter. December 1, 1977 A teenager, Daniel Pedersen, was lost when the unnamed small boat he was driving disappeared between Chignik Lake Village and Sand Point.December 19, 1977 Long time fisherman and ship pilot captain Jack W. Hopkins of Seldovia was lost along with pilot Gary Terry of Homer when their helicopter crashed seven miles southwest of Anchor Point on the way out to the Totem Ocean Trailer Express ship Greatland. The UF-22 was my father and uncle’s boat. R.L Taylor and Charles Taylor. Do you have any further information? do you know what remains of the boat were found? I am looking for more information about UF-22, which belonged to R.L and Charles Taylor, my father and brother. Actually Charles and R.L Taylor were brothers and they were partners. I have looked at my information about the UF-22 and everything I have is posted. I am going to try to get information from newspapers of that period. It may take some time. There must have been articles in the Kodiak Mirror between October 1977 and March 1978 as well as something in March 1978 about what wreckage was found. I was on the Overseas Chicago when we picked up the survivors of the Pacific Surf. The whole thing was quite miraculous. The survivors had been in the water for days, and were very nearly dead. Their radio calls hadn’t worked. Their raft was leaking in water and out air, and was almost sunk by the time we chanced by in the middle of the night, and someone happened to barely see their faint little light miles away. I think they also had some other survival gear problems/failures, but I don’t recall the details now. I don’t think either ship was on any usual shipping lanes; it was just a chance encounter. We were a supertanker enroute from probably San Francisco to Valdez. The people from the Pacific Surf sure would not have lasted much longer if we hadn’t come by. I always wondered if any newspaper reports of the time gave details on the story and who the people were, but I didn’t know where to look (pre-internet). We dropped the survivors off when we docked in Valdez, and then I went on to my next job, and always wondered what stories got written about the incident. I recently watched a PBS show about the FPV Galaxy fire in 2002, and that reminded me of this story and prompted me to google the only info – approximate date and Gulf Of Alaska location – that I had about it. I found this page, as well as a couple other sites with tidbits of details. I’ve also found redacted excerpts from a Coast Guard report about it dated 18 Oct 1977, but haven’t yet been able to find any record or source of the entire original report or a detailed NTSB report about it. I understand from another page on this site that there was a Seattle Times article about it, so I’m going to see if I can get a copy of that. It was an incredible story, and shows why you should never give up. These people had everything go wrong – ship sunk, faulty survival gear, no radio call, sinking raft, no search, no traffic – and yet most of them made it at the last minute. Thank you for posting. That was a miraculous rescue to say the least. I will email you the two Seattle Times articles that mentioned what happened back in 1977. I generally do not post survivor’s names in recent wrecks as a courtesy. Being a survivor of a shipwreck, particularly when there was loss of life, can be a psychological insult that does not need to be broadcast. The names are in the newspaper articles. Thank you again for taking the time to tell your story. Smooth Sailing…Captain Warren Good. Sorry for your loss. I was fishing out of Kodiak when your Dad was lost. An amazing story; the others were very lucky to have been found. They must have had a guardian angel. I have a copy of the Seattle Times, July 16, 1977 article but that is it. I was a crew member on the MV Ahaliq. It was reported that the Capt stayed with the vessel to save the crew, he had a multi page write up in the Seattle Times praising his heroic effort. There were a lot of things that factored into what caused the ship to sink,but the main factor were the actions of the Captain. Four crew members floated around in the Bering sea for four days in heavy seas because of him. He was no hero. Also, the cargo was not a load of logs, it was all the material and heavy equipment to build a water treatment plant in a village. Just want the truth out. Thanks for the post Dan. I have not had time to update the Ahaliq posts, but will in time. I am the same person who you contacted in August over on my Alaska Fishermen RIP on Facebook. Since then I have also been contacted by a retired government investigator who sent pictures and information about the Ahaliq. His memories about that tragedy are the same as yours and he had pictures and other details. I will make sure to include it when I remake this website and rewrite my Alaska Shipwrecks book. One of the pictures he sent shows the load the Ahaliq was carrying when she went down. I will email it to you. Thanks for checking in and helping me get this information right.